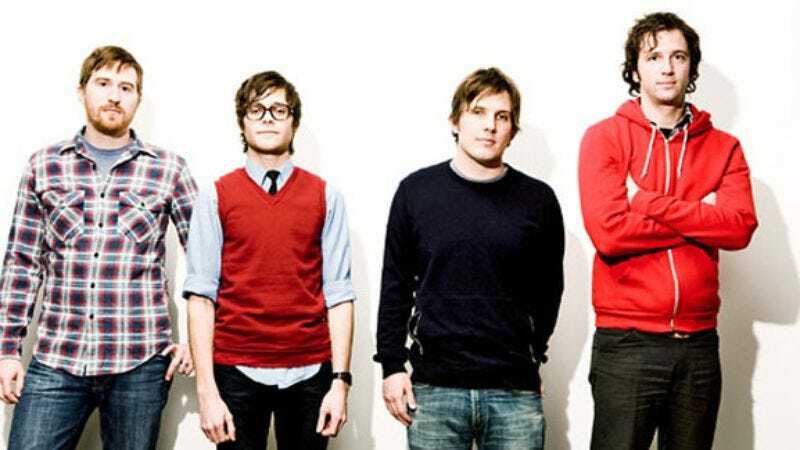 Tapes ’N Tapes’ much-anticipated 2008 sophomore album, Walk It Off, was a follow-up to 2005’s The Loon, an album that took the band from unknown status to buzz band—which meant it was the group’s first new album to face the potential backlash of critics and bloggers. One would think lead singer and guitarist Josh Grier might be sweating a little under all that pressure as his band prepared to embark on a two-month U.S. tour promoting Walk It Off. But when he talked to Decider a few days shy of Christmas, he sounded as calm and cordial as a data analyst who’d just escaped holiday layoff season unscathed. Oh, wait—he’s that too. Meet Josh Grier, a bona fide rock star with a day job. Tapes 'N Tapes plays a hometown show at First Avenue Feb. 6 with opening bands Wild Light and Solid Gold. Decider: Did you feel burdened by expectations while recording Walk It Off? D: Despite the band’s success, you’re still working as a data analyst. Do you find people are usually surprised by that? JG: I guess it’s kind of odd from an outside perspective. For most people, the whole point of being in a band is so you don’t have to work a job, right? I’m in a band and I’m working a job. But to each his own. It’s good to have something to do when we’re not touring. It’s a normal thing to do. I’m kind of a busybody. The job gives me something to do. D: Where do you go out for lunch when you’re at work? JG: I actually either have leftovers or frozen meals. I hardly ever go out. I used to go to Arby’s a lot, just because they’d send me coupons and it was cheap. I just bring my own food now. D: When you’re not brown-bagging, where do you like to eat in the city? Do you have a guilty pleasure? JG: There are a lot of really good restaurants in the greater Twin Cities area, but the one thing it seems I have to have at least once a week is sushi. D: Does that down-to-earth ethic of brown-bagging your lunch translate to how Tapes ’N Tapes operates as a band? You guys don’t seem to let yourselves revel in rock-star debauchery. JG: We’re a pretty tight-knit group and we keep everything pretty much in house. I think we try not to be wasteful. I think we try to flesh ideas out, and let them run their course, but at the same time, we try not to be overly self-indulgent about things. We try not to waste our time. D: Did it make a difference recording Walk It Off somewhere geographically new, at Tarbox Road Studios in upstate New York? JG: Yeah, I think it did. Wherever we are when we’re playing music, recording, whatever… if it’s a different setting, it will affect us—in ways that we won’t necessarily notice, at the time. But I definitely get in different mindsets when I’m in different places. D: What kind of mindset were you in this time around? Is there a general narrative or a cohesive mood to Walk It Off? JG: I don’t think there’s a general narrative. Maybe there’s a general mood, but I can’t put my finger on it. When we were writing the lyrics and recording, I was definitely in a certain state of mind, being out in the middle of nowhere in the fall. Seasons put me in different moods, but other than that, there’s never any conscious, “This needs to sound more like this, it needs to have more of this feel.” Whenever we’re making music or writing songs, I just want to be excited and interested in what we’re doing. If we’re doing a lot of stuff that’s similar, all at the same time, it gets a bit boring.